The Long Goodbye just might be my favorite Marlowe book yet. Loved The Big Sleep and The Little Sister, but this one trumps both of them. When I started reading this series, it was because I wanted to read Benjamin Black's new book The Black-Eyed Blonde (which I got yesterday! ), another Marlowe novel, and I wanted to see how his Marlowe stacks up to Chandler's, but I'd never read any Chandler. Since The Big Sleep, however, I've been reading these old books because I genuinely have come to love them. 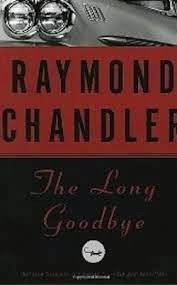 Life is not all about new and contemporary -- especially considering that Chandler has been an influence on many authors on down the crime-writing line. This book is the longest and most intense of all of them so far, and though it continues Chandler's run of overly-complicated and tangled plots, it's in this book where the author seems to have most fully expressed different facets of his real life, from alcoholism to publishing. "He would have told me the story of his life if I had asked him. But I never even asked him how he got his face smashed. If I had and he told me, it just possibly might have saved a couple of lives. Just possibly, no more." As it turns out, however, this random meeting with this man with the scarred face will take Marlowe down some of the darkest paths throughout Los Angeles -- leading him to crooked and corrupt cops, jail time, the world of the rich, famous and most powerful people, doctors who peddle narcotics to their patients, beautiful women, and, of course, murder. While you might say, well, this sounds a lot like every other Chandler novel, trust me -- it's not. But to say more would spoil everything. After reading and reporting on the five previous Marlowe novels, there's very little left for me to say about my favorite PI except for the fact that here his penchant for doing the right thing will turn into one of the most severe and personal betrayals of his career. However, it's really what Chandler says in and around Marlowe's work that I found most intriguing. He is no stranger to social criticism in these books, but here it's like he's also inserting much more of his personal life into the story. Everyone knows that Chandler was himself an alcoholic, and in this novel, alcoholism plays an extremely large and important role, with two alcoholic characters. One of them, the novelist Roger Wade, who admires F. Scott Fitzgerald, "the best drunken writer since Coleridge, who took dope," writes mass-appeal, popular historical books and is so drunk much of the time that he can't finish his latest one. Once he refers to himself as "a literary pimp." Through Wade, Chandler seems to be evoking his own emotional and other struggles with alcoholism as well as the whole writing biz. 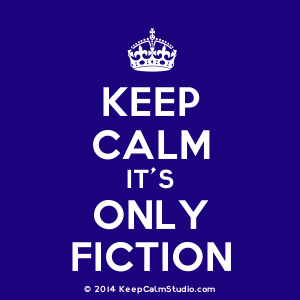 There is a most telling scene where Marlowe reads something "really wild" Wade wants him to get rid of before Mrs. Wade sees it (203-206), where Wade describes his ambivalence about drinking and writing. I must say, while I love all of the Marlowe novels, this one probably is Chandler at his ultimate finest. I'm so loving this series, and I loved this book. The Long Goodbye appeals to my need for edge, for in-depth character study and my constant search for intelligently-written crime fiction. These books are, as I've said a number of times, some of the best literary works in the crime genre. 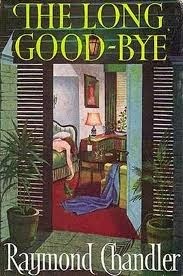 If you have not yet made the acquaintance of Philip Marlowe, it's something you need to do and soon.